I did. I let the dogs out. I let them out to roam the farm. To guard the chickens. To keep the geese out of the fresh shoots. To keep the deer at bay with their dog scent. I let them out to be sidekicks. To be companions all day long in and out of the fields. To trot along side the tractor. To hang at the edges of the fields. They choose, the dogs do. Watching. Often keeping one eye on the people and one on everything else. Waiting. Until it’s time to move to the next spot. A good farm dog is a pleasure to have around. A joy to see running toward you after he realizes you walked away when he had his head in the tall grass sniffing out the resident rabbit. It’s hard to keep one eye on the people when there’s a rabbit around. So, yes. It was me who let the dogs out. The two dogs that live with us and share our farm. And I will continue to let them out everyday because their farm-dog-ness makes this farm a much better place to be than if I didn’t let them out. Dziadzia & I love our grandogs! (And I know they love us). Has there ever been a farm without a dog/s? They are also well-behaved, listen attentively and play well with others. PS Glad to see they’re guarding all those lovely greens in the greenhouse. Can hardly wait for our 1st delivery of the season! They don’t usually go inside of the greenhouse, mostly hang just out the door. I couldn’t resist “posing” them in front of the bright green plants. 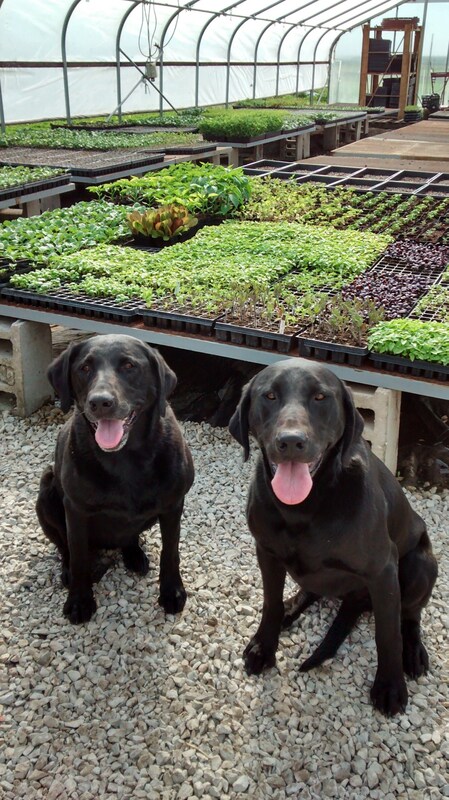 They remind me of our family’s black lab when we were kids…Thanks for sharing! Labs are super family dogs! They truly are part of the family.